The creators of Topaz Impression describe the product as “the only software that paints like a human instead of a computer.” Considering the vast number of applications of this type, that’s a pretty tough claim to verify. However, I can say that it gives the best results that this plugin junkie has ever seen. I particularly like the fact that Impression can be used as a standalone application or as a plugin. This makes it nice for Photoshop and PaintShop Pro users who want to use Impression for one component of the overall image-editing process, but it also allows others to take advantage of the software even if they don’t own any other photo-editing tool. So, how does it work? To begin, just open an image in Impression (or select Impression from your plugin menu if you already have an image open in a host editor) and click on any of the presets to immediately apply. If you decide you don’t like that setting after all, simply click on another until you find one that’s close to what you’re looking for and then click on the setting again to tweak the results. At any time, you can click on the Original button in the upper left corner of the application to remind yourself what the image looked like before you started making adjustments. The first time you use the software, you’ll be presented with a welcome tour that quickly walks you through Impression’s interface and tools. Although this is a nice feature and I recommend reviewing it, Impression is intuitive enough that you don’t really need this introductory tutorial. So, if you’re the type who likes to jump right in and learn as you go, you should be just fine. Topaz Impression does a great job of combining easy-to-use presets with a wide selection of tools that allow you to customize your results. Once you’ve selected a base style, such as Colored Pencil Drawing or Oil Painting, you can quickly access the settings for that style and modify them to achieve your desired result. Style settings are grouped into four areas: Stroke, Color, Lighting and Texture. Here’s where the real fun begins. 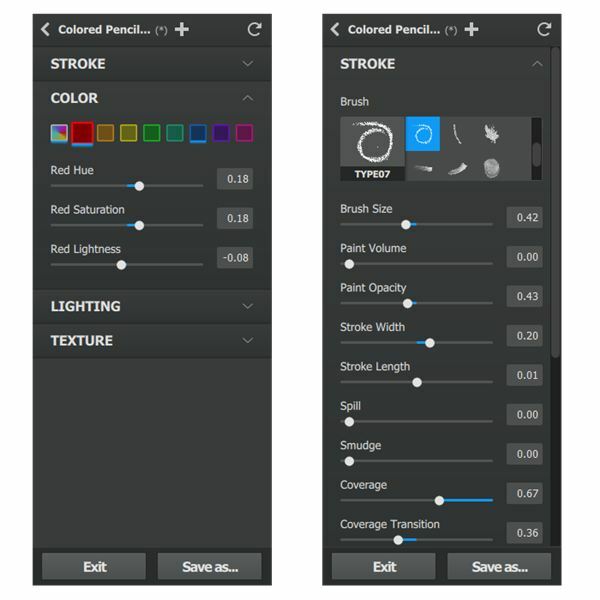 You can experiment with different settings simply by moving sliders back and forth, selecting a different brush stroke, choosing a different texture, and so on. The preview of your image will update with each change you make, so you can always reverse the modification if you don’t like it. Once you’ve found a collection of settings you like, don’t forget to save it as a new custom preset by clicking on the ~ezentity_lsquo+ezentity_rsquo~ button in the menu area of the settings panel. That way, you can easily apply the same style to any other photo with a single click. One thing I would love to see in a future release of Impression is the ability to easily export and import presets so that users can share the custom styles they’ve created with others. Similarly, I’d like to be able to quickly access other textures I’ve collected and use them within Impression. In addition to being a great application for photographers and graphic designers, Topaz Impression would also make a fantastic addition to any marketer’s toolbox. For instance, if you manage a Facebook or Google Plus Business Page, you’re probably all too familiar with the hassle it takes to find good quality, unique pictures to share on your page. Not only do you have to worry about the subject of the photo, but you need to find something that has the right lighting, colors, contrast… the list goes on and on. The above image shows a photo I found on Pixabay, a great site for finding free public domain pictures. Even though the original photo (shown on the left) is quite nice, it took less than a minute to make the scene look more spring-like with Topaz Impression. You could then take the resulting image and use Canva or another free online tool to add a text overlay or other elements, and post the final image to your social media pages. Topaz Impression requires Mac OS X 10.8 or Windows 7 x64 (or higher). In addition, if you’re a Windows user, your graphics card will need to support OpenGL 3.2 or higher. For more information on supported video cards, check out the help center at Topaz Labs. As mentioned earlier, Impression can be used as a standalone program or as a plugin for Photoshop, Photoshop Elements, PaintShop Pro, and a few other image-editing tools. Visit the support area on the Topaz Labs website for more details on plugin compatibility. Topaz Impression retails for $99.99, and it’s also part of the Complete Collection, which includes all 15 of Topaz Labs’ photo-editing tools for $429.99. That may sound a bit steep for some budgets, but Impression’s capabilities make it worth every penny – especially if you do a lot of work with images. In addition, there’s a free trial of the software available so you can try it out for yourself and then decide if it’s worth your investment. At the very least, I recommend downloading the free trial and testing Impression out. Fair warning, though – be prepared to lose track of time when you’re experimenting with all the different possibilities. Impression is not only extremely useful, it’s also a lot of fun.